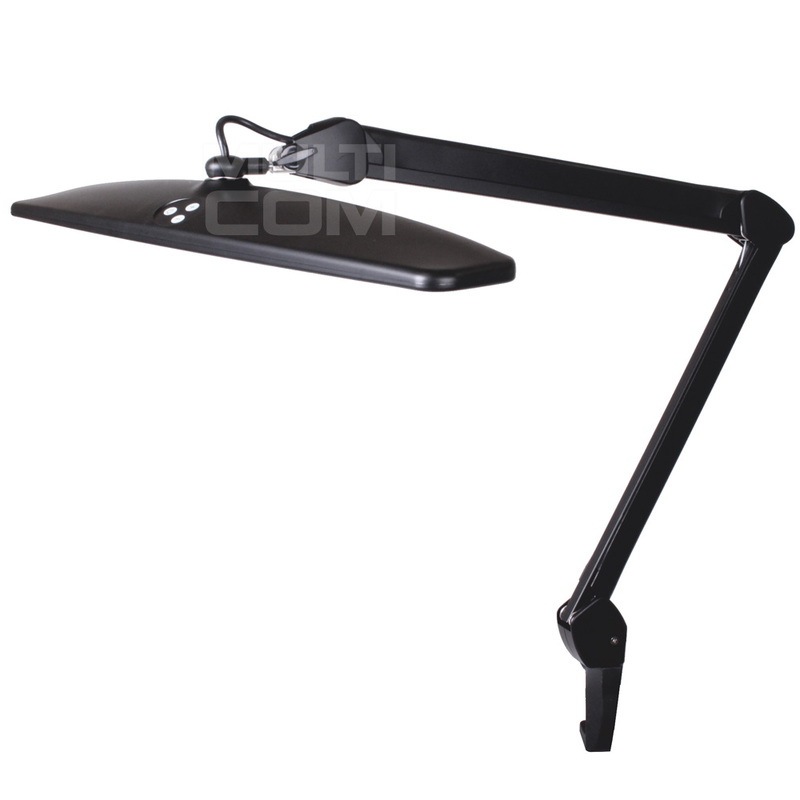 Desk Lamp with magnifying glass (127mm) 8066D2 5D LED is the ESD lamp with a magnifying glass 5D and mount to the table. Loupe made of optical glass ensures the highest quality of observation. Lighting implemented using 90 pieces of LEDs receiving only 8W. The use of LED technology ensures long and trouble-free service life of the lamp. At the same time the LEDs do not generate tiring for the eyes flicker. The product complies with the standard IEC 61340-5-1 so it can be used in the production, service and inspection of electronic products. 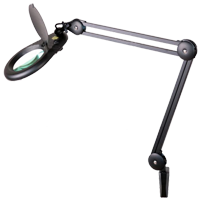 Lamp with magnifier (127mm) 8066-1C 8D i's proffeiosnal lamp mounted on moveable arm that protects your eyes when you work for repairing field. this table lamp comes with high-frequency 4200Hz lamp without frequent sparking for avoiding harmful to eyes after long-time working, since long time work under deficient light at normal 50Hz/60Hz can cause short eyesight and many eye diseases. and the 8x magnifier brings the work up close to you for much easy working. It is very useful tool for people who is doing repairing business. 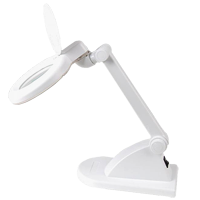 Lamp with magnifier (127mm) 8066-1C 3D i's proffeiosnal lamp mounted on moveable arm that protects your eyes when you work for repairing field. this table lamp comes with high-frequency 4200Hz lamp without frequent sparking for avoiding harmful to eyes after long-time working, since long time work under deficient light at normal 50Hz/60Hz can cause short eyesight and many eye diseases. and the 8x magnifier brings the work up close to you for much easy working. It is very useful tool for people who is doing repairing business. 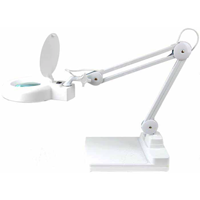 Lamp with magnifier (127mm) and stand 8066-2BHC-1C 8D i's proffeiosnal lamp mounted on moveable arm that protects your eyes when you work for repairing field. this table lamp comes with high-frequency 4200Hz lamp without frequent sparking for avoiding harmful to eyes after long-time working, since long time work under deficient light at normal 50Hz/60Hz can cause short eyesight and many eye diseases. and the 8x magnifier brings the work up close to you for much easy working. It is very useful tool for people who is doing repairing business. 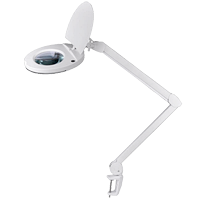 Lamp NAR0300 with magnifier 5D (80 LED) is proffeiosnalworkshop lamp with glass lens and a magnification of 5 diopters. Mounted only on a horizontal worktop with a thickness of 1.25 - 6.25 cm, has adjustable arms, mounted on the base of the boom. Thanks giving bright white fluorescent light and built-in anti-reflective lens filter long-term work with the lamp does not produce eye fatigue. 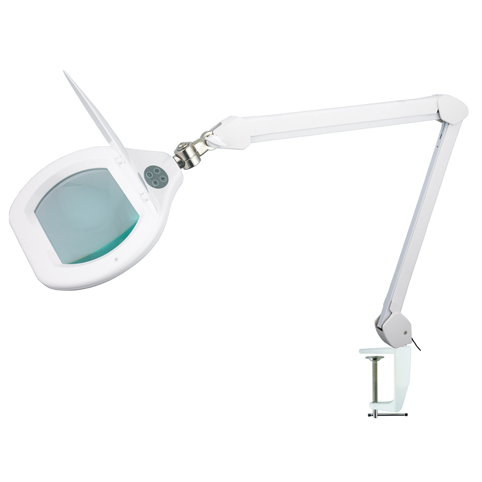 Lamp NAR0299 with magnifier x5 (T4 22W)is proffeiosnal lamp mounted on moveable arm that protects your eyes when you work for repairing field. this table lamp comes with high-frequency 4200Hz lamp without frequent sparking for avoiding harmful to eyes after long-time working, since long time work under deficient light at normal 50Hz/60Hz can cause short eyesight and many eye diseases. and the 8x magnifier brings the work up close to you for much easy working. It is very useful tool for people who is doing repairing business. Lamp 8069 with magnifier 5D (2 x 9W) is proffeiosnal lamp mounted on moveable arm that protects your eyes when you work for repairing field. this table lamp comes with high-frequency 4200Hz lamp without frequent sparking for avoiding harmful to eyes after long-time working, since long time work under deficient light at normal 50Hz/60Hz can cause short eyesight and many eye diseases. and the 8x magnifier brings the work up close to you for much easy working. It is very useful tool for people who is doing repairing business. Lamp 8069 LED SMD (190x157mm) ESD 8069D2LED-A with magnifier 5D 2-10W radiates bright, stable and reliable light, without the effect of reflections (glare) and harmless to the human eye. The combination of a magnifying lens and lighting allows for more accurate and deeper viewing of even small objects. You can use the lamp as a normal illuminating source, for example a work surface or use a magnifying glass depending on your needs. 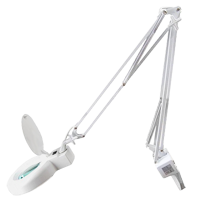 By mounting the lamp on movable joints you can adjust the height of its position and incline depending on your needs. Table lamp 90mm 3D+12D 12W is proffeiosnal lamp mounted on moveable arm that protects your eyes when you work for repairing field. this table lamp comes with high-frequency 4200Hz lamp without frequent sparking for avoiding harmful to eyes after long-time working, since long time work under deficient light at normal 50Hz/60Hz can cause short eyesight and many eye diseases. and the 8x magnifier brings the work up close to you for much easy working. It is very useful tool for people who is doing repairing business. Workshop lamp SMD LED with 8067LED-U 3D 2.5-20W power supply with external power supply (equipped) with a long cord (180cm). Two light sections in the luminaire and the ability to run all 84 LEDs or 42 LEDs dramatically improves work comfort. 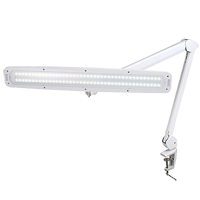 Smooth adjustment of the light intensity, smooth adjustment of the lamp arm inclination and luminaire with the lens guarantees optimum illumination. It has a rotating (350 °) fluent adjustment of the luminaire with a lens. Workshop LED lamp (580mm) 8015LED-U 2,5-20W is elegant and efficient LED (84 SMD LED in two row) lighting with the possibility to adjust the angle and distance to the surface to witch is attached. The lamp have 4 levels adjustable light intensity. LED current offer no effect of blinking lights as it is in traditional fluorescent lamps fitted. Workshop LED lamp (580mm) 8015LED-U ESD 5-21W elegant and economical LED lighting with the possibility of adjusting the angle of inclination and distance of the luminaire to the surface to which it is attached. The lamp has a 4-degree adjustable illumination. The state-of-the-art LED diodes used in addition to the current savings ensure no light blinking effect as in traditional lamps equipped with fluorescent lamps. 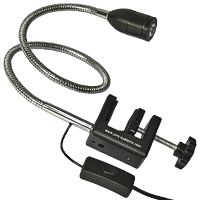 Cobra Light 360 is light source designed to be fitted to the XY table or to the working bench with our special C-Clamp. 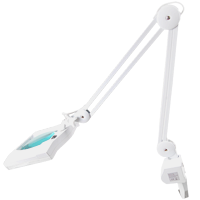 Jovy ™ LED-Light source provides powerful illumination flux, and its arm length allows free workspace for user, which suits any additional inspection instruments (magnifying Lens or video microscope) or rework tools such as tweezers or components picker. The LED-Light is recommended to be used separately as a light source, with different fixation methods. It could be used with a magnifying lens or microscope. The Flexible arm can be fitted to our C-Clamp either into position for horizontal direction or into position for vertical direction. 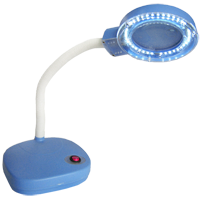 Aoyue 927 lamp with magnifier is an indispensable tool for every laboratory and workshop. 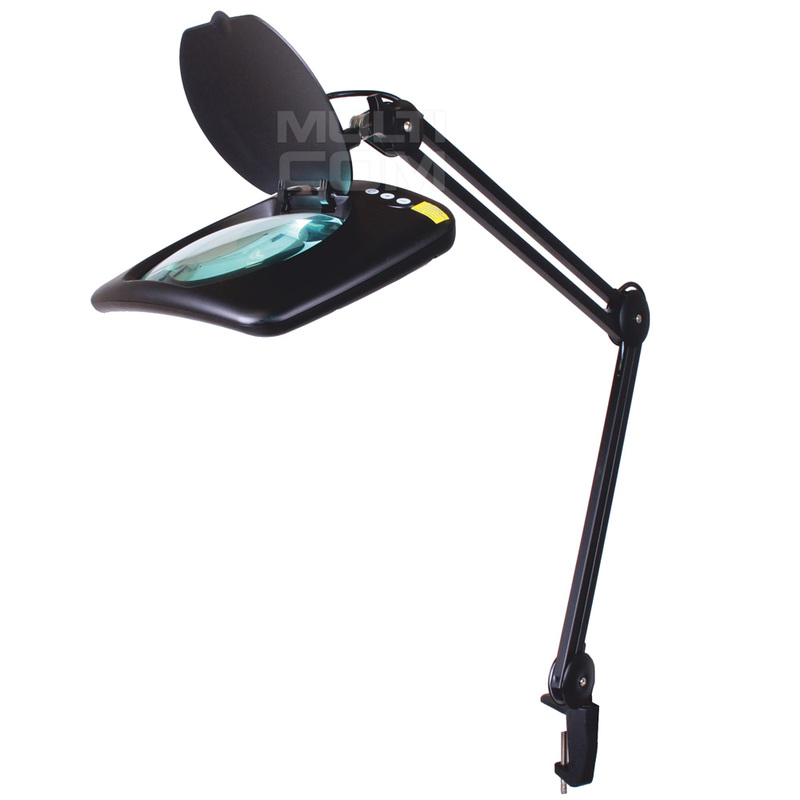 Aoyue 927 is a modernized version of the lamp / magnifier 929 produced by AOYUE. By using LEDs it has a very long life and bright, white light.